Here are some snazzy birthday facts about 14th of November 1968 that no one tells you about. Don’t wait a minute longer and jump in using the content links below. Average read time of 10 minutes. Enjoy! What day was my birthday Nov 14, 1968? November 14, 1968 was a Thursday and it was the 319th day of the year 1968. It was the 46th Thursday of that year. The next time you can reuse your old 1968 calendar will be in 2024. Both calendars will be exactly the same! This is assuming you are not interested in the dates for Easter and other irregular holidays that are based on a lunisolar calendar. There are 206 days left before your next birthday. You will be 51 years old when that day comes. There have been 18,421 days from the day you were born up to today. If you’ve been sleeping 8 hours daily since birth, then you have slept a total of 6,140 days or 16.81 years. You spent 33% of your life sleeping. Since night and day always follow each other, there were precisely 624 full moons after you were born up to this day. How many of them did you see? The next full moon that you can see will be on May 18 at 21:13:00 GMT – Saturday. Fun stat: Your first one billion seconds (1,000,000,000) happened sometime on July 23, 2000. If a dog named Margarita - a Sussex Spaniel breed, was born on the same date as you then it will be 220 dog years old today. A dog’s first human year is equal to 15 dog years. Dogs age differently depending on breed and size. When you reach the age of 6 Margarita will be 40 dog years old. From that point forward a small-sized dog like Margarita will age 4 dog years for every human year. Al Shorta SC, one of Iraq’s biggest football clubs, are founded as Montakhab Al Shorta. World War II: In England, Coventry is heavily bombed by German Luftwaffe bombers. Coventry Cathedral is almost completely destroyed. Lech Wałęsa, the leader of Poland’s outlawed Solidarity movement, is released after eleven months of internment near the Soviet border. Astronomers Michael E. Brown, Chad Trujillo, and David L. Rabinowitz discover 90377 Sedna, a Trans-Neptunian object. The first G-20 economic summit opens in Washington, D.C.
What does my birthday November 14, 1968 mean? 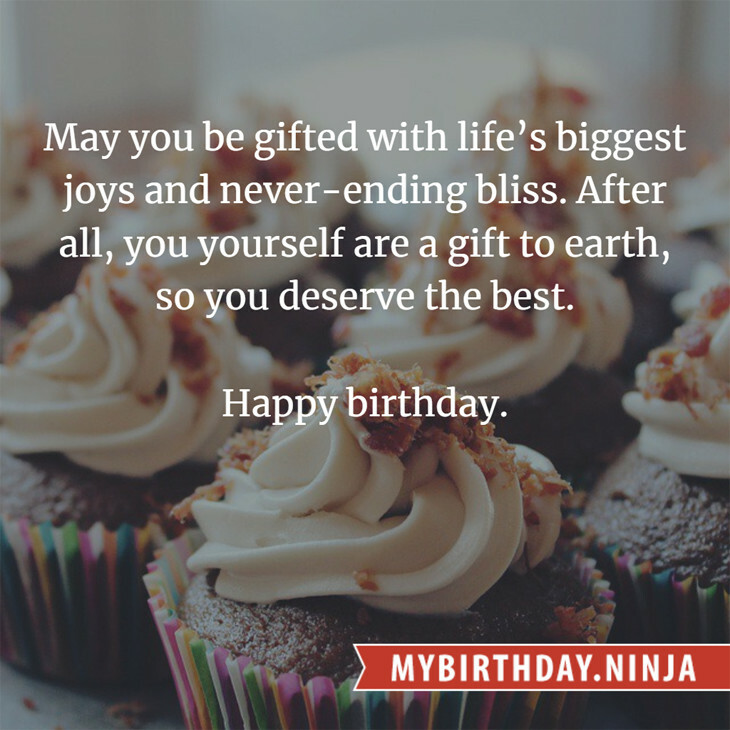 Your birthday numbers 11, 14, and 1968 reveal that your Life Path number is 22. It is a master number that represents practical idealism and material mastery. You were born under the most powerful and potentially the most successful of all Life Path numbers. The following celebrities also have the same life path number: Rina Akiyama, Constance Cummings, Elliott Gould, Max Schreck, Austin Williams, Ashley Crow, Dean Jagger, Helga Krapf, Tessa Allen, Lewis Fitz-Gerald. What is the birthday horoscope for Nov 14, 1968? The Western zodiac or sun sign of a person born on November 14 is Scorpio ♏ (The Scorpion) – a fixed sign with Water as Western element. The ruling planet is Pluto – the planet of transformation. According to the ancient art of Chinese astrology (or Eastern zodiac), Monkey is the mythical animal and Earth is the Eastern element of a person born on November 14, 1968. Fun fact: The birth flower for 14th November 1968 is Chrysanthemum for loveliness. 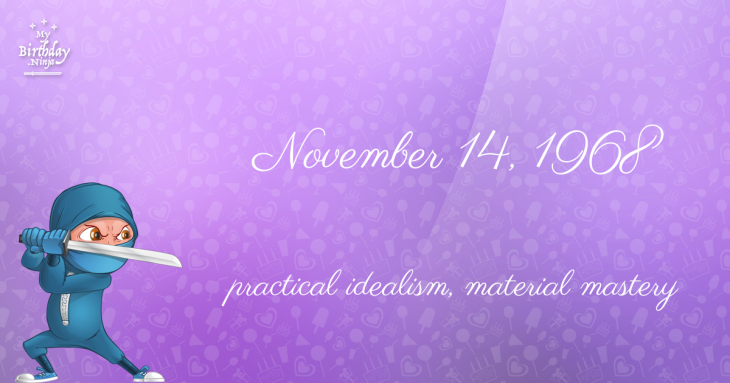 What is the Love Match for Nov 14, 1968? When it comes to love and relationship, you are most compatible with a person born on January 17, 1996. You have a Love Match compatibility score of +182. Imagine being in love with your soul mate. On the negative side, you are most incompatible with a person born on June 26, 1951. Your incompatibility score is -142. You’ll be like a cat and a dog on a love-hate relationship. Arf-arf, I want to bite you. Meow-meow, stay away from me! The number-one hit song in the U.S. at the day of your birth was Hey Jude by The Beatles as compiled by Billboard Hot 100 (November 16, 1968). Ask your parents if they know this popular song. I do not know how you feel about this, but you were a female ♀ in your last earthly incarnation. You were born somewhere around the territory of Saudi Arabia approximately on 600. Your profession was shepherd, horseman, forester. How many babies were born on November 14, 1968? Base on the data published by the United Nations Population Division, an estimated 120,171,727 babies were born throughout the world in the year 1968. The estimated number of babies born on 14th November 1968 is 328,338. That’s equivalent to 228 babies every minute. Try to imagine if all of them are crying at the same time. What is the popular baby name on 14 Nov 1968? Here’s a quick list of all the fun birthday facts about November 14, 1968. Celebrities, famous birthdays, historical events, and past life were excluded. Try another birth date of someone you know or try the birthday of these celebrities: May 17, 1911 – Lisa Fonssagrives, Swedish-American model (d. 1992); October 10, 1959 – Eric Fellner, English film producer; June 16, 1946 – Mark Ritts, American actor, puppeteer, and producer (d. 2009).